Version 1.4 Made the second Bonus Level possible in case the airship is destroyed. I might add 5 more bonus levels in the future, and I may also add some more bonus levels to Blockhead Chapter 2 also sometime. Until then, enjoy this game, and be on the lookout for the fourth and final game, plus a possible remake of this. Version 1.3 Made the first Bonus Level easier. Be on the lookout for the fourth and final game in the series, Blockhead Chapter 4. But that is not the end of the story, as I plan on remaking this game and making a new series. 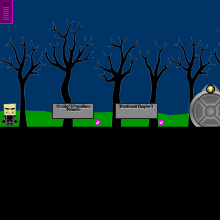 Version 1.2 Added level and names of levels. Version 1.1 Added Bonus Level. You are Blockhead, a warrior of the 21st century. Chapter One tells of your beggining. Well, you see, you were a homeless person. One day, you found these ninja cloths without the mask. You also find a dull sword and a leather shield. You are on a mission to rid the world from evil. NOTE: Republished with a bonus level added. This is now free for the public to play. It was going to be my Epic Game Drop game for 2012, but then I realized it was too short, so I published it privatly. My Epic Game Drop game for 2013 was MazeMasterZ: Elemental Education, which is horrible. Two Travelers is now going to be Choose. Be on the lookout for that.